Most people in Toronto and the GTA will likely remember the winter of 2013-2014 for the destructive ice storms that struck the area in December and the slick/icy conditions that remained for several weeks into the following year. There were countless news stories of downed trees and power lines that caused extensive property damage and personal hardship; it is likely that many residents would like to forget what happened that winter. One of the secondary consequences of those ice storms was that many homeowners and property owners were left without a sufficient amount of ice melting material. Quantities on hand were quickly depleted and most/all local suppliers were unable to replenish their inventories to accommodate the demand; this made matters somewhat treacherous for several weeks for people walking around their property and neighbourhood or just going about their daily business/routines. The use of this liquid brine product is also an example of Landcare’s commitment to help reduce the impact of various chemicals/treatments on the environment by incorporating organic products into all general maintenance and landscaping practices when possible. 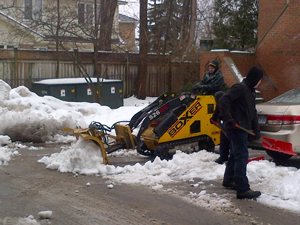 Of course, ice melting will not be the only maintenance aspect that property owners will be facing this winter; there will undoubtedly be numerous occasions when snow removal will also be required. 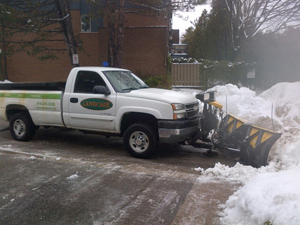 Landcare offers a complete winter maintenance program that includes snow removal and ice melting throughout the season for residential, multi-residential, commercial, and industrial properties. This program customarily begins in mid-November and extends for a period of five months. To ensure that your property receives the winter maintenance it requires, including ice melting and snow removal, call the professionals at Landcare today at 416-410-0320 to discuss and confirm the program that best suits your needs.